This video documents methods for collecting coastal marine water samples and processing them for various downstream applications including biomass concentration, nucleic acid purification, cell abundance, nutrient and trace gas analyses. This video documents methods for collecting coastal marine water samples and processing them for various downstream applications including biomass concentration, nucleic acid purification, cell abundance, nutrient and trace gas analyses. For today's demonstration samples were collected from the deck of the HMS John Strickland operating in Saanich Inlet. An A-frame derrick, with a multi-purpose winch and cable system, is used in combination with Niskin or Go-Flo water sampling bottles. Conductivity, Temperature, and Depth (CTD) sensors are also used to sample the underlying water mass. 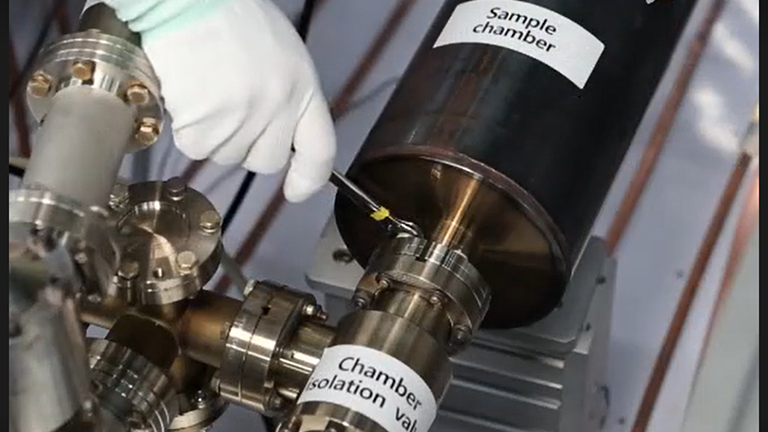 To minimize outgassing, trace gas samples are collected first. Then, nutrients, water chemistry, and cell counts are determined. Finally, waters are collected for biomass filtration. The set-up and collection time for a single cast is ~1.5 hours at a maximum depth of 215 meters. Therefore, a total of 6 hours is generally needed to complete the collection series described here. Depths are assigned to each cast. 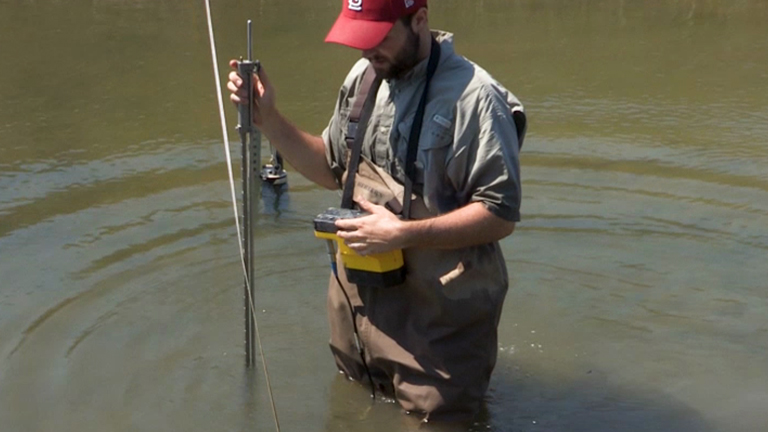 Depths to be sampled and the total volume to be collected for the current cast are determined. It is ensured that the Go-Flo and Niskin bottles are open, and that their valves and spigots are closed. The CTD is loaded onto bottom of the line and lower into water. A bottle for the deepest depth sampled in cast first is loaded onto the line after the CTD; it is ensured that the line is properly fitted into bracket and the screws are tightened. A messenger is attached to each bottle (except the deepest one) before lowering. The line is lowered the distance between the first depth and the next; another bottle is then loaded. It should be noted that for depths where 20L are collected for filtration, a total of 2 12L bottles are loaded consecutively about .75m apart. Once all the bottles are on the line, the line is lowered to the desired depth and 2 minutes are allowed to pass. A messenger is sent down and a few minutes are allowed to pass to ensure that all bottles close. The line is reeled in and the bottles are unloaded as they come up onto the racks. For depths that require 20L samples for DNA and RNA, two Niskin bottles are collected. One bottle is used to sample the chemical parameters (see below), while the other is drained into the carboy. RNA is collected immediately from the second Niskin. The remainder of the first is also drained into the carboy to give ~20L final volume. For low-resolution samples only 1L of water is set aside for filtration in sterile Nalgene bottles. If oxygen samples are needed, they are collected first. A piece of thin tubing is attached to the Niskin/Go-Flo spigot and the other end of the tubing is placed place into the glass serum bottles. The serum bottle is rinsed 3 times with sample water, and filled to overflowing such that no air bubbles are present. 50μl mercury chloride (HgCl2) are added to the serum bottle in a way that doesn't introduce air bubbles into the sample. The bottle is sealed with a rubber stopper and crimped with an aluminum cap, and is then stored on ice in a cooler. A 60 cc syringe is rinsed with sample water, an (0.2 μm) is attached in-line and some water is pushed through the acrodisc. A polyethylene bottle is rinsed with ~10 ml filtered water 3 times (shake bottle when rinsing). Filtered sample water is added to the bottles, about ¾ full. The sample is stored on ice in the cooler. Sample tubes are rinsed with sample water. Sample tubes are filled completely with sample water. 5ml of sample water are taken out using a 10ml pipet; the rest of the water in the tube is discarded and the 5ml in the pipet tip are replaced into the sample tube. 7.5ml of ammonium working reagent is added to each tube once samples from all depths have been collected. A pre-labelled 50 ml Falcon tube containing 5.4 ml 37%formaldehyde is filled to the top for a final concentration of 4%. Care is taken not to spill. A pre-labelled 50 ml Falcon tube containing 20% zinc acetate (Zn(O2CCH3)2) is filled to the top. Care is taken not to spill. 1-litre bottles are filled to the top. The final outcome of seawater sampling results in approximately 12 dissolved oxygen samples, 32-48 gas samples, 16 nutrient samples, 32 ammonium samples, 16 hydrogen sulfide samples, 16 samples for cell counts, 6 20-litre carboys, 16 1-litre bottles and 4 Sterivex 0.22μm filters containing microbial biomass preserved with RNA later. Overall, there is a great deal of preparation and planning required for this type of sampling, so budget 2 days before the trip to get things in order and one day afterwards for cleaning everything up. In general, do not let salt water come into contact with the peristaltic pump or into the aluminum Zarges box used to transport the field equipment. Treat the equipment with respect and it will perform well for a long time to come. We would like to thank the Canadian Foundation for Innovation, the British Columbia Knowledge Development Fund and the National Sciences and Engineering Research Council (NSERC) of Canada for supporting ongoing studies on low oxygen regions of coastal and open ocean waters. In addition, D.A.W. was supported by fellowships from NSERC, Killam and the TULA foundation funded Centre for Microbial Diversity and Evolution.